Seth Meise, relationship banker, Associated Bank, organized a piggy bank contest for the fourth grade classes at Lodi Elementary School and Lodi Primary School after reading about the idea from another Associated Bank colleague, Bret Kuether. He believed that hosting a similar contest would be a fun and creative way to deliver the important message of saving to the Lodi students. Meise had been talking with parents and teachers who are customers at the Lodi branch who expressed a desire to have their children and students learn about saving. The parents indicated it can be hard to teach their own sons and daughters to save, and the teachers shared that they do not do very much teaching about saving at the fourth grade level. To help future generations learn more about saving and why it is important, Meise thought of the idea to do a presentation on the topic of saving money. He worked with the principals of the schools to obtain approval to speak to the fourth grade classes. The students enjoyed decorating their banks with a variety of colorful materials including paint, yarn, feathers, and pipe cleaners. 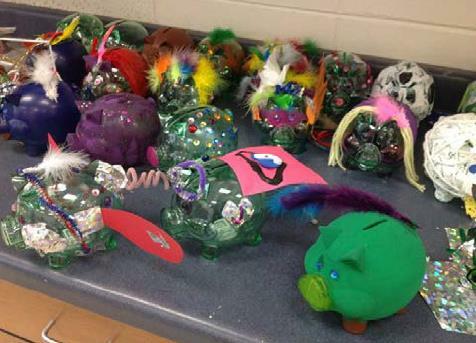 The piggy banks were then judged by colleagues at the Lodi branch, and Meise presented cash prizes and certificates of achievement to ten winners. The schools and Meise have decided to name the contest, open to all fourth graders, the “Annual Associated Bank Piggy Bank Contest” which will continue to show Associated’s support for and dedication to not only the schools, but also to the future of Lodi.